As a rail fan and street railway enthusiast, I find myself drawn to the era of the Horse Car. I can imagine one of the bells from my collection hanging from the horses hames, sounding out with each step to warn of the car's approach. These were days long before my time, when innocence gave way to progress, and mans burden was made lighter by these wonderful animals. They knew their route and dutifully responded to the conductors bell. They knew the faces of some of their patrons and would stop for them when spotted along the way. However, by 1888 a steepening decline in their service had begun, as the electric trolley made its appearance. 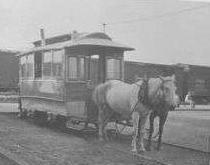 The Horse Car Lines largely disappeared in less than a decade. "The harness for the street car horse or mule consisted of a collar, hames, traces, reins and bridle. A small bell was attached to the lower portion of the collar which the animals movement kept in a continuous jingle along the street, thus warning pedestrians to clear the way." 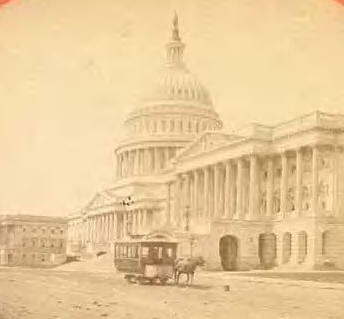 A horse drawn car passes in front of the United States Capitol Building before the turn of the century. If you find the information on this site helpful, we could use your help to keep it up and running. If you wish, you may make a donation of any size by using the Paypal link. Thank you.